Coconut mushrooms! How awesome! Indian cuisine is just fascinating! wow! lovely presentation and looks so tastyyy!! wow................superb dish dear. lovely clicks. Wow ! very nice combo...new to me..will give it a try soon. Fantastic mushroom thoran, looks prefect Sarah! Amazing dish! I can get the taste by reading. Whats great is that you have kept the honor of Mushrooms by sparing garam masala in this dish. No wonder you have the largest followers! both r my favorites.vaayil vellam varunnu. Hi. This is such an interesting combination, look great. lovely and a yummmmmmmmmmmmmm thoran and nice combo. i make this too..but a lil diff...love it! Yummy combo! My fav but never tried with coconut. Whenever I get fresh mushrooms I used to cook this dish. I can just enjoy that plate of thoran just like that super super delcious. Lovely combo...I make mushroom thoran without egg...next time will try this :). a very different preparation that what i make..should give a try..
Ethu kalakki...onnu try cheythu nokkanm..looks very yummy dear! Like the combination...mushroom and eggs. Seems a-easy-to-cook recipe and no doubt tasty. Very different combo... looks yumm. that sounds like a gr8 combo.. Excellent combo da, your so innovative to combine these delicious egg and mushrooms. Drool worthy dish!!! 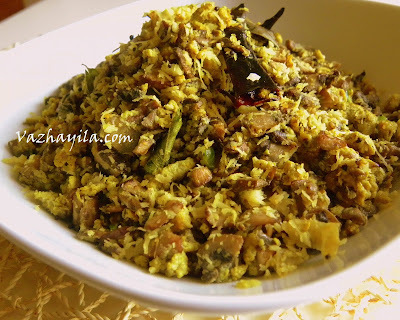 Muttai thoran seems a great idea ...very filling with mushroom addition. Lovely click dear. A New way to cook mushrooms- I have never cooked mushrooms this way by chopping them finely.Looks so delicious. Amazing Click. Thanks for sharing this recipe. Mushroom is my new love now a days...great dish to go with rotis. Thanks for the warm comment at my space, dear. It means so much. YUM! I love stir-fries and this one sounds like it would be my favorite if I could try it!!! Nice job! The dish looks yummy! Nice recipe. A different way to cook mushrooms. Never tried this combination , will surely try out!!! I love mushrooms! I really like all the vegetarian dishes you have in your blog. Darls,I know you are very creative,but this is out of the world.These are things that we use evryday, but never thought we could combine it an make a tasty combo.tasty tasty.. Interesting combination. Looks great Sarah! A very unique combo.. got to try it some time..
very tasty and nutritious thoran! great combo with rice!